Use this 5 gallon bucket and padded seat combo to store and carry food and camping items, emergency preparedness equipment and supplies; or just for storage of household items fishing and sports gear. This sturdy plastic bucket can withstand 400 lbs. and has a black foam cushion that is perfect for sitting. The bucket also has a wire handle with a plastic grip that makes it easy and convenient for carrying and pouring. The bucket also has an integrated molded handle on each side and a molded handle on the bottom of the bucket for ease of maneuverability when carrying, lifting and pouring heavy items. 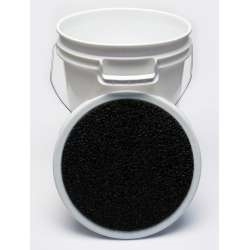 The lid fits tight and secure to the bucket while still being easily removable with your bare hands. This bucket has the child drowning warning label printed on the side wall of the pail. White with black padded seat only.